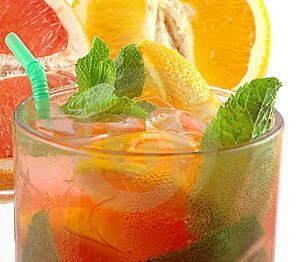 Orange mint soda is a refreshing drink to have on hand during the hot summer months. For ginger mint syrup, chop mint leaves roughly, peel and cut ginger into small pieces and keep them aside. Now switch off the stove and add chopped mint leaves in it. Cover it with a wrap or cover, later the leaves color will change from fresh green color to dull green color. Take off the cover and drain the liquid from it through a fine sieve, pressing the solid to get more syrup from it. Now cool the mixture. Mint syrup is ready. Do not boil the mint as this will cook it and hence the taste changes. Cover and refrigerate till approx 3 weeks or till it lasts. Pour orange juice equally in serving glasses, then add ice, as desired, to the glasses. Distribute lime soda equally to each glass and add the ginger mint syrup to bring out the flavor. Garnish the glasses with mint leaves and orange slices. Serve cold.